A Supreme Failure – The confirmation process of now-Justice Brett Kavanaugh, and the claim of sexual misconduct against him by Dr. Christine Blasey Ford, forced the American people to face a real and terrible dilemma, as the parties involved were two very accomplished, credible people telling totally different stories, with neither of them being able to offer any corroborating or exculpatory evidence. This created a heart-wrenching scenario; if she was innocently mistaken about his identity then Justice Kavanaugh has been subjected to wrongful and irreparable harm, and if he was lying or had forgotten the incident then she was being assaulted again by him, this time in public. At this moment in our history, in wake of #MeToo, nothing was more important than for us to handle this situation correctly. Unfortunately, the United States Senate, who was tasked with this incredibly poignant and difficult responsibility, failed miserably. Because of the way the Senate mishandled this nomination, we now find ourselves even more deeply divided than before. Their lack of adherence to the rules, due process, and basic tenets of fairness – irrespective of which “side” you are on – created an outcome that is distasteful to most, and perhaps unjust; either an innocent man with what appears to have been an impeccable career finds himself marked with an asterisk, or someone who is now serving on the United States Supreme Court sexually assaulted a young woman and lied to Congress about it. Politics so corrupted this process that we have no ability for clarity in our evaluation. The Senate’s short-sighted and selfish attitude of “win at all costs” has also created a question as to the political nature of the Supreme Court going forward. Today, we find ourselves in a situation where all liberal justices have been appointed by Democrats, and all conservative justices have been appointed by Republicans, with no apparent swing votes. This result is both tragic and dangerous. As an institution, the Supreme Court has the final say on what rights can be taken away from us by the government, as well as what laws conflict with the Constitution and are therefore invalid. In my opinion, nothing is more critical to American democracy than having confidence in the Supreme Court, which entails making sure that well qualified justices, without any political axe to grind, are appointed. Presidents will come and go, but Supreme Court justices are for life. Unable to go back in time, we must now demand that this broken process be fixed before we descend even further. Below, I set forth some very practical steps both the Senate and the Supreme Court can take to help us heal and reunite as a nation. I hope they realize how important this moment is to our country. Congress needs to make bipartisan bills a priority (and force the media to report on them). Human nature always seems to be more intrigued with a good drama resulting in a knock-down-drag-out fight, rather than a bunch of folks sitting around a campfire singing Kumbaya. This is clear today: flip between Fox, CNN, and MSNBC and instead of impartial journalists reporting facts you will find red or blue cheerleaders fanning the flames of discourse. Right now, more than ever, our elected representatives must step up and help reunite this country by finding compromise and coming forth with bipartisan bills, which are already very prevalent (in 2017, of the 296 bills passed by Congress, 97 of them were bipartisan). Such a message is critical, and will serve as a powerful reminder to the people that we are the United States of America. Additionally, our elected officials must insist that the media report these success stories with the same intensity they use to report the disagreements. The Supreme Court should make it a priority to have fewer 5-4 decisions. This confirmation hearing started out as abnormally ferocious because the nominee would fill the seat of Justice Kennedy, a “swing vote” in several important cases including Roe v. Wade. Being the Supreme Court has complete control over how many and what cases they hear (they typically receive 7,000 requests each year and usually take fewer than 100), all the Justices should make it a priority to take cases that will not result in a 5-4 decision. And in the most difficult cases where there is a close call, Chief Justice Roberts should make it his mission to find a way for there to be more compromise in the final decision to avoid a simple party-line vote. The Senate must reinstate the 60-vote cloture rule. Until 2013, the Senate rule relating to cloture was that a vote of 60 Senators was needed to end debate and take a vote. Absent the agreement of at least 60, a filibuster could be invoked, meaning the issue would never come to a vote. This rule was critical, as it helped ensure that Senators would be forced to display moderation and compromise. Moreover, because of the rule, Presidents were reluctant to nominate anyone requiring the confirmation of the Senate with extreme views as they would not likely get the required votes. All of that started to change, however, in 2013 when the Senate Democrats, frustrated that the Republican Senators were blocking all of President Obama’s lower court judicial nominees, changed the rule so that only a simple majority was needed to move forward all judicial nominees except for Supreme Court Justices, which would remain at 60. This rule was changed again in 2017 so that only a simple majority was needed even for Supreme Court nominees, when the Republicans found themselves in the majority but unable to muster 60 votes to have Neil Gorsuch confirmed. Shame on both parties for changing the rules so they could “win” rather than seek compromise. Could you imagine the outrage if during football season a majority of the owners were allowed to change the rules to suit them? If it sounds outrageous in the context of football, how does it possibly make sense when it comes to judicial nominees? If we are ever going to stop these extreme partisan outcomes, we must demand that the Senate reenact the 60-vote rule on cloture as it relates to all judicial nominees. Senate Judiciary Committee members need to rotate. I won’t try to make the case for term limits for the entire Senate here, as it would take up a full essay, but an easier point that would have a tremendously positive impact on future Supreme Court nominees is to regularly rotate the Senators who serve on the Judiciary Committee. It was disheartening – and frankly ridiculous – to see many of the same faces on the Committee considering Brett Kavanaugh’s confirmation that considered Clarence Thomas’s, and have them still completely mishandle the process. Additionally, this current Committee is clearly unable to find compromise, as has been demonstrated by the way they treated the previous two nominees (Garland and Gorsuch); in both instances they used, ignored, and changed rules to get their way rather than rely on debate and compromise. New blood on the committee for each Supreme Court nominee could help erase these ugly tendencies. Seventh, Senators should be prohibited from publicly disclosing what their vote will be on a nominee until the final hearing is concluded. Universal elements of fairness and justice require that there be full and complete disclosure of all relevant facts before any voting member of a tribunal reaches a decision; this process is necessary to build public confidence that those sitting in judgment are open-minded. While I am not naïve enough to think that politicians will ever be able to approach these situations with fully open minds, they should at least give the American public the impression of fairness by not stating what their final vote will be on a nominee until after the hearing has concluded. The current environment, which tolerates statements by Senators that they will vote against anyone a President nominates (even before the nomination is made) is barbaric and only serves to undermine the process. It’s hard to believe that with so much at stake the United States Senate chose to put party loyalty and political aspirations above stability in our democracy, principles of justice, and human dignity. In his remarks after being sworn in Brett Kavanaugh said that the process had not changed him; I hope it has. I hope as a Supreme Court Justice he is more patient and understanding of the helplessness felt by the poor and minority defendants who are accused, that he better understands the challenges survivors of sexual abuse face in bringing their claims, and that he understands clearly why politics has no place in our judicial system. ($40.00). This delightful pinot is very light, smooth, and dry. Fruity and spicy, this wine pairs perfectly with a medium rare strip steak and mac and cheese! Praxis Makes Perfect – I enjoyed learning more about Praxis Public Relations recently from my Energeia colleague Paul Tonna. 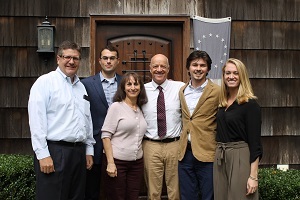 We introduced members of our respective teams at “The Barn,” the beautifully restored farmhouse in Huntington that Praxis calls home. I look forward to collaborating more with Paul on our Energeia work and other initiatives. 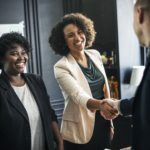 Growing Small Business – Long Island’s small business community has extraordinary resources at their fingertips, as revealed by our most recent episode of CMM Live. I welcomed Joseph Camberato, President and Co-Founder of National Business Capital, to the studio to discuss alternative financing sources and financial products designed specifically for the small business owner. Joe also shared his own fast and furious business growth story. I was also happy to catch up with Elizabeth Malafi of the Miller Business Resource Center at the Middle Country Public Library, who discussed the untapped resources that the Miller Center offers to small business owners and entrepreneurs, from skill-building to networking to databases. If you haven’t taken advantage, you’re missing out! Check out the full episode here. 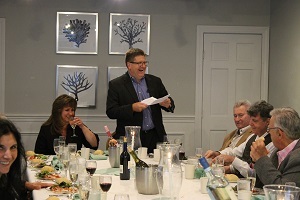 Board Retreat – A great time was had by all at the HIA-LI Board of Directors 40th Anniversary dinner at Danfords. Over a celebratory dinner, I raised a glass to HIA-LI’s most notable achievements over the past four decades, to President & CEO Terri Alessi-Miceli (a visionary leader and tireless advocate who knows how to strategically build consensus while also knowing how to diplomatically throw an elbow! ), and to the next 40 years of growing Long Island business. Cheers! Solar System – A successful solar initiative can differentiate the Hauppauge Industrial Park as the single largest rooftop distributed energy project in the country, dwarfing Silicon Valley. 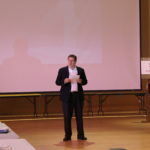 I recently joined Solar Committee chairs Scott Maskin and Jack Kulka as well as PSEG representatives at HIA-LI’s Solar Town Hall to share more about this initiative and how the savings can help landlords and businesses save money. 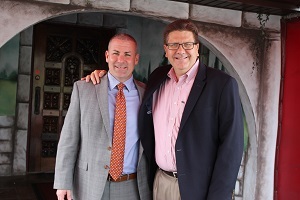 Catch Up with Keith – Over lunch last week at Mario Restaurant in Hauppauge I enjoyed swordfish and conversation with Keith Lawlor, who was recently promoted to Regional Vice President at TD Bank. Keith is a great guy and I couldn’t be happier for him. Cannabis and Coffee – I had a very interesting conversation with Jim Aspromonti, Partner at Marcum, last week over breakfast at the Premier Diner in Commack, about his work in the cannabis space. Our discussion was fascinating, and I mysteriously left with the munchies. CMM Academy – 2019 is right around the corner…do you have a plan yet to make it your best year in business? I’m very excited to present “Bleed to Succeed” next Tuesday, October 16 in our brand new state-of-the-art training classroom at our Ronkonkoma headquarters. I’ll offer a personal look at how to define your own success in our competitive world, drawing inspiration from my grandmother, who at age 98 still inspires me and whose work ethic has shaped my life and career path. The presentation will help you set and surpass goals to achieve the success you envision. Join us for lunch, networking, and the presentation – limited seats available! Details and registration are available here. I hope to see you there.